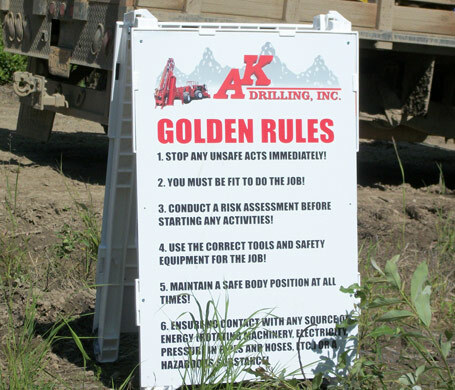 Safety & Training - AK Drilling, Inc.
At AK Drilling, we are committed to providing a safe work environment for our employees and clients. We utilize a comprehensive employee training program and conduct frequent on site safety inspections of our drilling equipment and personnel. Our Health and Safety Plan and Standard Operating Procedures have been designed to ensure that where ever a project takes AK Drilling our work sites are safe, healthy and environmentally responsible. We continually review and update our training and safety programs in order to effectively manage the risks inherent in our industry. We approach training as an integral component of our Safety Program, continually examining and updating our safety training and equipment.